This map. I have loved it for as long as I can remember. From a young age, viagra canada medical I was obsessed with the 1964-1965 New York World’s Fair. Born just a few years after the fair ended, discount cialis levitra the map represented a fair I could never ever go to. I grew up with my grandmother’s stories of the 1939-1940 fair and my parents’ stories of the 1964-1965. But I couldn’t go. Born after. 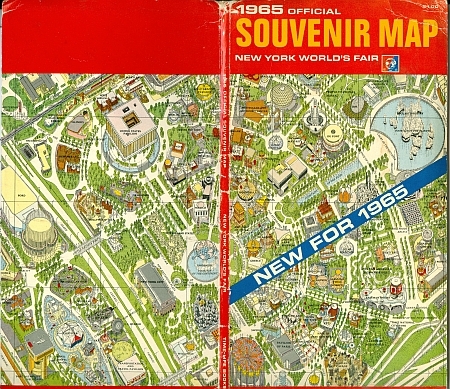 However, mind the public library had a folder of items from the Fair, including this map, that a helpful librarian handed to me at a young age to plug my endless questions. 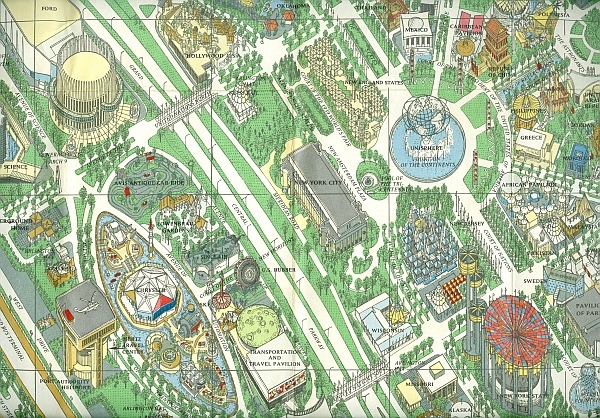 And so opening it up there it was, in full color, laid out in a wonderful isometric perspective by Hernann Bollmann. This is one of many copies I now own. The map was (according to the legend) “created by Hermann Bollman of Pictorial Maps, Inc., for Time Inc.” The map was created in conjunction with Bollmann’s more famous, groundbreaking (and more expensive now!) isometric map of New York City. See here for more on that map. 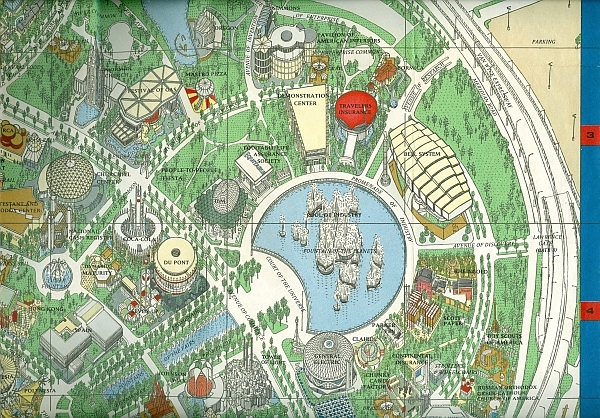 This map replicates the isometric approach to showcase the 1964-1965 World’s Fair. 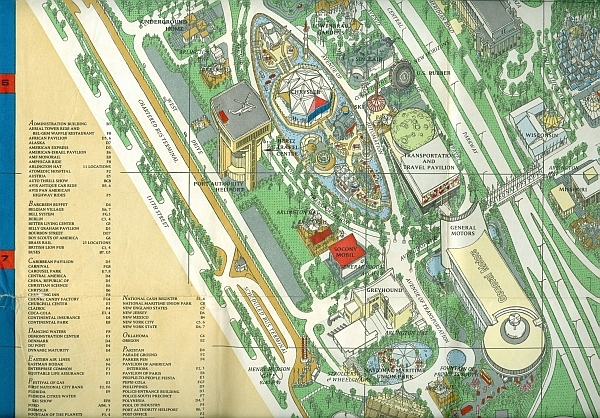 This map is the 1965 version of the fair; some pavilions and exhibitors changed from 1964 to 1965. For a massive full size view of the map click here to get to my flickr page. 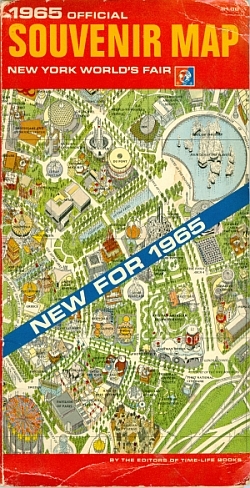 The 1964-1965 fair was probably one of the last of what I would call “optimistic” World’s Fairs in which the General Motors’ pavilion could represent “progress” and the “future” through clear cutting the Amazon and covering it with paved roads and colonizing the deeps with extractive human colonies. The fairs of Expo ’67 in Montreal and Osaka in 1970 were already transitioning to a less-optimistic “future” then 1964-65. Nowadays we have EPCOT and far less exciting fairs like Hannover 2000. My own view is that the internet and global satellite television has ended the ability of World’s Fair’s to impress and create wonder. Like the 1964-1965 New York World’s Fair, World’s Fair’s or Expos are lost in the past. Hi there! Love this map. Wow. Can you imagine how long it took to create? I want to produce an isometric map of my village with a commercial interest to sell advertising space. A design that will be colourful and playful as well. Do you have any recommend for how to build such a creation? I have already spliced together google satellite images to get the streets and buildings in place. Would love to have your ideas/ suggestions. This is a great map indeed. I have the 1964 version framed and hanging over my desk. Bollman did an amazing job of capturing the details of the Fair. Thanks for highlighting it.